I’ve you’ve visited before you’ve probably noticed things look a little bit different. I’ll be the first to admit—the old template had the personality of a wardrobe. I scoured the internet for a customisable template with the basic layout to my liking and found a just-released template called ‘Superhero’ by Automattic, a company founded by one of the original developers of WordPress—so I knew I was dealing with a quality product. I spent the rest of last weekend fiddling with the CSS files to get the colour scheme and widgets as close as possible to my version of perfect. Now, I’m not a programmer, and have no desire to be a programmer, so there was a lot of trial and error involved. However, I have more than 20 years’ experience in corporate graphic design and branding—the day job—which has given me a eye for the finer details. I need things to look just right or it bugs the hell out of me. Colour scheme, graphics and widgets working and ticked off the list, it was time to look at that huge blank canvas that is the homepage slider. It’s all well and good to be able to get snappy with a camera, and it’s easy to take pretty pictures when you live somewhere with so many beautiful outdoor spaces nearby—but slapping a few well-exposed photos in this space didn’t do it justice. I whipped out Adobe Illustrator and created myself a little stamp graphic to brand each image... things started to move in the right direction. I added some quotes to express a bit of feeling for each photo. But I wanted something a little bit more unique for the main image—a lucky shot of my R1200GS in a tunnel in Surrey where the camera’s flash had misfired, giving the photo a slightly gritty quality. In the bottom of a drawer I found an old Wacom Graphire tablet of 2001 vintage and amazingly the latest software, which is more than 5 years old, worked on my computer—despite Wacom’s website hinting otherwise. Doodling on the photo, I realised that I was focusing on the negatives—wrong tyres for the muddy road and masonry that threatened the paintwork (and my body, had I lost control on the mud)—the same excuses you hear time and time again from people who buy these capable bikes but never take them out to get a little bit dirty now and then. 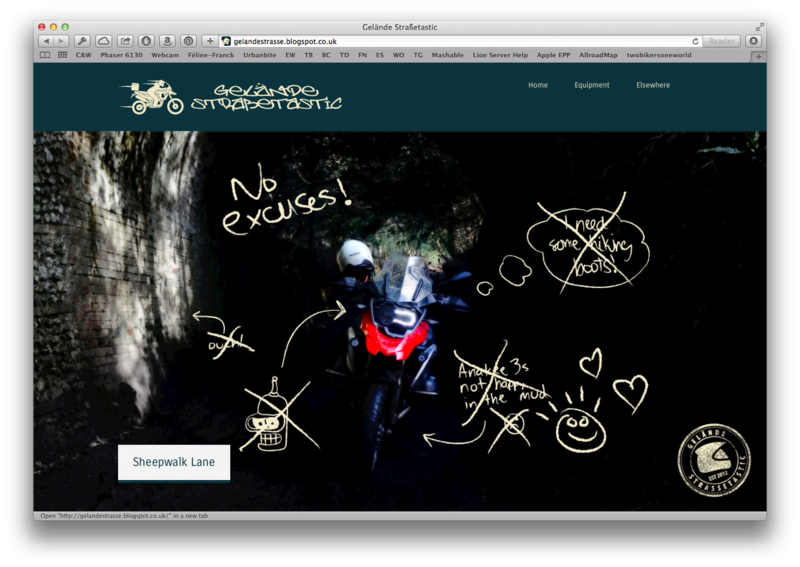 So the negatives were crossed out and the heading ‘No excuses’ added, along with a beaming happy face and hearts to represent how it makes me feel to get out there and explore. With a new look and focus I would love to hear from readers—you—not only about your thoughts, but also your ideas for features. Don’t be shy.